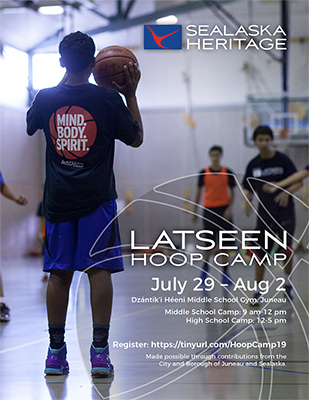 Sealaska Heritage Institute will sponsor its annual Latseen Hoop Camp in Juneau in August and feature Bob Saviers, a current coach for Juneau's Hoop Time Amateur Athletic Union (AAU). The camp is for students entering grades 6-12 and is scheduled July 29-Aug. 2 from 9 am-12 pm for middle school students and 12 pm-5 pm for high school students. Students may apply online. The program is made possible through the contributions from the City and Borough of Juneau and Sealaska. Coach Saviers was one of the originators of the current Hooptime AAU and started coaching for Hooptime when Edd Webb, the founder of Hooptime, asked him to coach in 2000. He has coached 18 years for Hooptime AAU at all levels. He has been head coach for Dzantik’I Heeni 7th and 8th grade and Floyd Dryden 7th and 8th grade boys over the years. Bob works closely with all coaches of Hooptime from the 3rd grade to the 8th grade as well as the high schools athletes and programs. He continues to coach with Coach George Houston and both teaches AAU coaching clinics and attends coaching clinics in order to stay in high school and the college level certification for NCAA/AAU events. He is currently also Head Coach for the High School AAU program. He has placed athletes in college in recruitment periods over the last 8 years.